Want to be notified of new releases in stampery/mongoaudit? This is the recommended installation method in case you have python and pip. Use this if and only if python and pip are not available on your platform. If you are serious about security you should always use the PIP installer or, better yet, follow best security practices: clone this repository, check the source code and only then run it with python mongoaudit. It is widely known that there are quite a few holes in MongoDB's default configuration settings. This fact, combined with abundant lazy system administrators and developers, has led to what the press has called the MongoDB apocalypse. 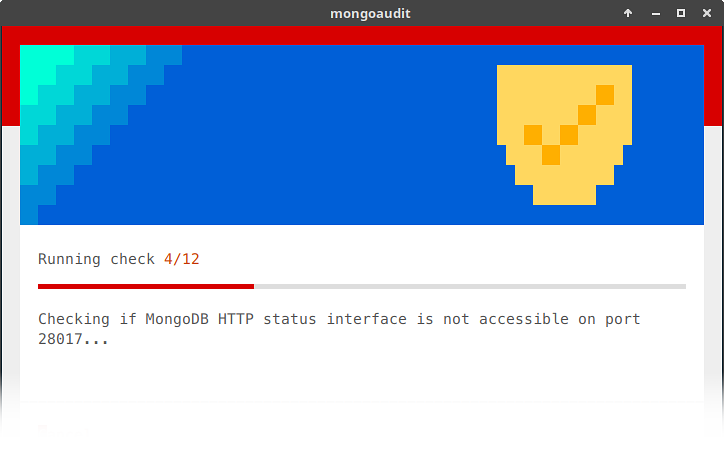 mongoaudit not only detects misconfigurations, known vulnerabilities and bugs but also gives you advice on how to fix them, recommends best practices and teaches you how to DevOp like a pro! Tests marked with an asterisk (*) require valid authentication credentials. How can I best secure my MongoDB? Once you run any of the test suites provided by mongoaudit, it will offer you to receive a fully detailed report via email. This personalized report links to a series of useful guides on how to fix every specific issue and how to harden your MongoDB deployments. For your convenience, we have also published the mongoaudit guides in our Medium publication. Open an issue with suggestions for improvements and errors you're facing. Fork this repository and submit a pull request. Make your suggested changes, git push and then submit a pull request. mongoaudit is released under the [MIT License](https://github.com/stampery/mongoaudit/blob/master/LICENSE). Never use this tool on servers you don't own. Unauthorized access to strangers' computer systems is a crime in many countries. Please use this tool is at your own risk. We will accept no liability for any loss or damage which you may incur no matter how caused. This software is not supported or endorsed in any way by MongoDB Inc., Compose Inc., ObjectsLab Corporation nor other products or services providers it interoperates with. It neither tries to mimic or replace any software originally conceived by the owners of those products and services. In the same manner, any third party's trademark or intellectual property that may appear in this software must be understood as a strictly illustrative reference to the service provider it represents, and is never used in any way that may lead to confusion, so no abuse is intended.